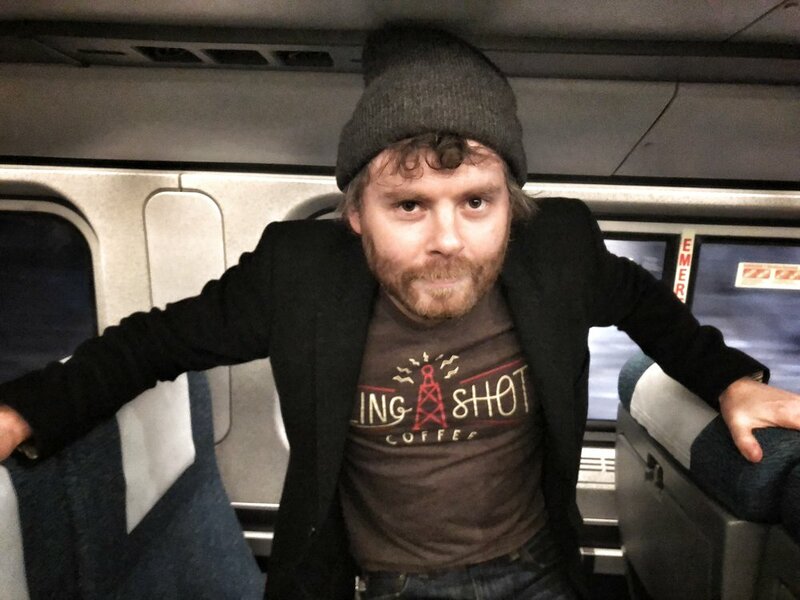 In February, I had the privilege of working with Gabriel Kahane, who had arranged a few songs from his new album, Book of Travelers, for a small chamber ensemble. On our train ride back to New York from Saratoga Springs, where we had just performed the songs together, I asked Gabriel if I could interview him and he kindly accepted. It turned out that he had done some extensive research on Britten while he was composing his theatre piece, February House, name after the house in Brooklyn where Britten lived from 1940 to 1941. So he knew a lot about Britten, much more than me! Thanks to Gabriel for sharing his thoughts. Gabriel: The first piece of Britten’s that I have a strong relationship with was his War Requiem, which I sang when I was in high school. I totally fell in love with it. M: What were your first impressions? G: I think he was an amazing storyteller. That juxtaposition of the requiem mass text and the Wilfred Owen poems—the way he tells the story of the First World War—is so vivid. One of the things that really resonates with me as a composer about Britten’s music is that he is unapologetically looking to the past and to the future at the same time. In some circles he is still perceived as being conservative, but undoubtedly his music sounds like nothing else out there. There is such a clear voice. I don’t think I had a particularly sophisticated sense of what made his music so unique at the time, but there was something about it that is both immediately accessible and yet totally personal. M: Is that how you would describe his music to someone who doesn’t know Britten? G: I don’t know… There is a way in which, as he matures, the vast majority of his music feels really unselfconscious and unburdened by a need to be preoccupied with the trends of the moment. When he was living in Brooklyn, he was around 27 or 28, and I think after that there is this shift where he stops being as imitative, you hear less of Mahler’s influence… and it’s somehow very English. M: Our program this season revolves around the question “how do I live in a broken world?”—I think Britten was someone who was very aware and conscious of the society he lived in. As a composer, do you incorporate what is going on around the world into your music? G: Yeah, you can’t help but do that. You know, in social justice circles there is this ‘moving walkway’ metaphor—if you agree that the status quo is broken and you’re standing still on the moving walkway, then you’re reinforcing the status quo and you’re being an agent against change. I think that the digital space works in two conflicting ways. On the one hand it has illuminated major structural injustices in a really positive sense. Like #metoo and #blacklivesmatter. On the other hand, the digital space makes us more siloed than we were before. I think, while the Trump era is terrifying in so many ways and it has endangered the lives of so many people, I think it has also created a kind of awakening. In the midst of awakening, it’s hard to make any kind of work that isn’t trying to work against the status quo. M: Do you think music has the power to bring about human connections in order to make that change? G: My album, Book of Travelers, is about reconnecting to the very simple universal connections we have as people regardless of ideological difference and about the belief that, if we are going to heal politically, first we have to heal on a human level. What I’m trying to do with this larger piece is to open people up by giving them access to a whole bunch of stories, most of which are in the first person “I”. But we don’t see these people, we don’t see their faces, we don’t know what their identity is. We are just asked to invest in their stories. As the piece goes on, we start to understand that there are conflicting grievances among these people. I’m asking people first to empathize with a variety of people and then to come to terms with the fact that we all have legitimate grievances and that any hierarchy of grievances just doesn’t work. Do I think music has the power to affect change? I do. Music is emotionally manipulative. If I can make someone empathize with a person whom in their life they would otherwise not have empathy for, then maybe I have succeeded in opening them up a little bit. I think fundamentally as a songwriter I am always trafficking in empathy as a currency of the work and I think empathy is an agent for change. G: I don’t know that I’d want to ask him questions! I’m content to let dead heroes exist through the work that we have.